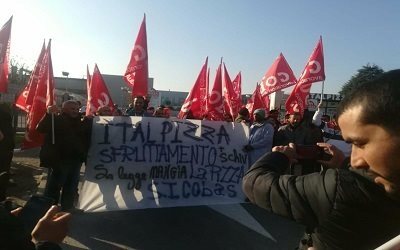 [INTERNAZIONALISMO] Il 2/2 assemblea nazionale a Bologna: contro l’ondata repressiva e razzista, smascheriamo l’imbroglio del finto cambiamento e rilanciamo l’opposizione di classe al governo Di Maio-Salvini: costruiamo il fronte unico anticapitalista! – "TOCCANO UNO TOCCANO TUTTI"
Su questi temi il SI Cobas convoca per sabato 2 febbraio alle 14 a Bologna, presso la sede di via Saffi 30, un confronto pubblico a cui sono invitate a partecipare tutte le realtà che in questi mesi hanno contribuito alla costruzione delle iniziative di lotta comuni con una prospettiva internazionale e internazionalista, dunque valorizzando non solo il tessuto di relazioni che in questi anni si sono sedimentate a livello nazionale, ma anche i contatti che attorno a questa proposta si sono avviati in questi mesi con realtà politiche, sindacali e di lotta di altri paesi. SATURDAY FEBRUARY 2 nd AT 10:30 a.m.
Italy is the first large Western European country with a populist government, and the terrain for a new kind of class warfare: dividing native from immigrant working-class people, dragging Italian workers behind the cart of nationalism (under the disguised name of “sovereignism”), tightening up repression against any kind of independent working class and environmental struggle. Working class people got fed up with the left-of-centre governments, which, even more so than right-of-centre governments, have carried out openly pro-business “reforms”, increasing the precarisation of labour and the tax burden on workers, while giving out presents to companies and banks. The living and working conditions of millions of workers have worsened, because of the lingering capitalist crisis and of the bosses’ workplace attacks. These are the reasons why many working-class people have voted the two populist parties, 5-Star Movement and League, in last year’s elections, giving credit to populist promises. We should not count on a quick reversal of mood among workers as they find that their living conditions are not improving, because the populist parties are stoking people’s anger against both the internal enemy – immigrants – and the external ones – with the EU and France and Germany in the forefront. – twice as much for organisers (all gilets jaunes should be imprisoned!) and for housing occupations; immigrants committing these “crimes” shall lose their residence permits and can be deported back to their countries. This law can also be applied against strike pickets, as requested by the Association of Transport employers – Confetra -, which has thanked the government for it. But we don’t need to wait for the enforcement of the “Security Decree”: we are witnessing an increasingly repressive behaviour of the police against strikes and demonstrations, while the judiciary, strongly pressed by the political system, is taking an increasingly partisan stand against workers’ and social struggles. This has occurred with the recent sentence to up to 2 ½ years of detention to shop stewards, union organisers and supporters for a strike picket of 2015 at DHL, in spite of the public prosecutor asking for acquittal because no offence had been committed (DHL had locked out the warehouse); an organizer of SLAI Cobas pSC has recently been condemned to house arrest because of a struggle of the unemployed in 2010; many arrests and condemnations have been made against environmental and anti-militarist movements such as NO-TAV, NO-TAP, NO-MUOS; a Romanian activist of the movement for the right to housing has been expelled from Italy while thousands of occupants of empty council houses or private buildings have been evicted – including mothers with small children in winter time – with huge military deployments. And we are waiting for the conclusion of the trial plotted by the police against SI Cobas national coordinator Aldo Milani for “extortion”, with no evidence whatsoever. SI Cobas has organized the first national demonstration against the Security Decree in Rome on October 27, 2018, which was successful beyond our best expectations, and participated to other demonstrations that followed. 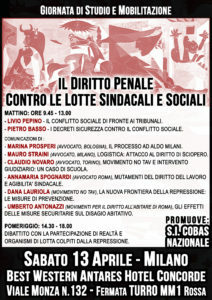 There is the need to build a broad front of working class opposition, uniting all organisations and people against racism, nationalism, repression – and carry out initiatives, both at the Italian national level and Europe-wide and beyond, with the aim of winning over a majority of the working class. The platform of official trade unions CGIL, CISL and UIL for their demonstration of Feb. 9 has no words against precarisation, racism, repression, nationalism. The reactionary character of the populist government comes out most blatantly in its policy towards women, which echoes fascist times, aiming at subduing women to men’s will, and shutting them back inside their homes, with the task of breeding the offspring that the country needs as labour for capital in normal times and as cannon fodder in war. It is not a coincidence that the two main decision makers on the gender issue (the minister Lorenzo Fontana and Simone Pillon, the author of the a Family Bill) are aligned to the most reactionary, clerical and fascist-like milieus that are active in Poland as in Austria, France and Spain. Against this bill the women’s movement NUDM has organised a large demonstration held in Rome on November 24. The yellow vest movement in France shows that there is a deep discontent in the unorganized working class, which expresses itself in new forms of struggle, not only shunning traditional reformist representation, but it can also reject populist manipulation, and find connections with combative organized workers – what SUD Solidaires comrades are working for. Their movement is an example for us to follow and learn from. The Hungarian trade unions and workers in general have strongly reacted against the “slave law” allowing up to 400 hours of overtime for each worker yearly. This shows the true class nature of populism: “bosses first”, on the shoulders of workers, native and immigrant as well! Populism can gain workers’ minds where workers are disillusioned about self-proclaimed “workers parties” that have implemented bourgeois policies as in Brazil, where Bolsonaro won elections. CSP Conlutas, the leading Brazilian member of the International Labour Network of Solidarity and Struggle we belong to, is also engaged in building a broad working class front against the attacks of the new right-wing populist government. We wish them success and follow their struggle. In these days Italian populist leaders are ‘discovering’, and railing against, French and German imperialisms – because of tough competition with Italian imperialism over Libya and its oil, and in shipbuilding and other sectors. They are trying to obtain mass support to Italy’s corporate and strategic interests. We oppose the attempt to field workers against our exploiters’ adversaries. At the same time France and Germany with their newly signed ‘friendship’ treaty, are trying to overcome – or set aside – their differences and join forces – also militarily – for dominance in Europe and worldwide, while they also are repressing radical struggles and movements at home. SI Cobas invites all organisations and activists, in Italy and abroad, who share this working-class, internationalist view and urgency of action to join forces and establish a network of struggle not only in the trade-union field but in the wider social arena. 8 of March, Women’s day of struggle. In all continents the women’s movement has been the only truly international movement of social struggle in the last few years; this year it is to take on an even stronger significance in Italy, against the Pillon Bill. May Day, the international working class day of struggle.